. 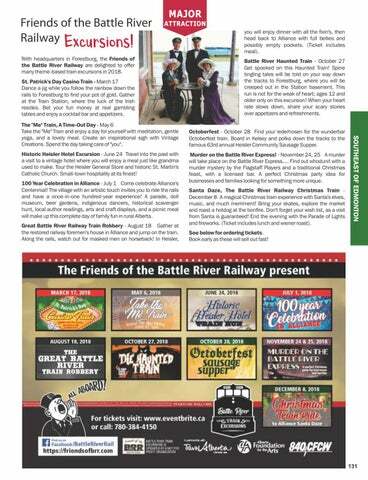 With headquarters in Forestburg, the Friends of the Battle River Railway are delighted to offer many theme-based train excursions in 2018. St. Patrick's Day Casino Train - March 17 Dance a jig while you follow the rainbow down the rails to Forestburg to find your pot of gold. Gather at the Train Station, where the luck of the Irish resides. Bet your fun money at real gambling tables and enjoy a cocktail bar and appetizers. Battle River Haunted Train - October 27 Get spooked on this Haunted Train! Spine tingling tales will be told on your way down the tracks to Forestburg, where you will be creeped out in the Station basement. This run is not for the weak of heart; ages 12 and older only on this excursion! When your heart rate slows down, share your scary stories over appetizers and refreshments. Octoberfest - October 28 Find your lederhosen for the wunderbar Octoberfest train. Board in Kelsey and polka down the tracks to the famous 63rd annual Heisler Community Sausage Supper. Murder on the Battle River Express! - November 24, 25 A murder will take place on the Battle River Express.... Find out whodunit with a murder mystery by the Flagstaff Players and a traditional Christmas feast, with a licensed bar. A perfect Christmas party idea for businesses and families looking for something more unique. Santa Daze, The Battle River Railway Christmas Train December 8 A magical Christmas train experience with Santa's elves, music, and much merriment! Bring your skates, explore the market and roast a hotdog at the bonfire. Don't forget your wish list, as a visit from Santa is guaranteed! End the evening with the Parade of Lights and fireworks. 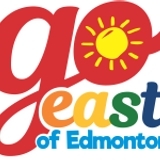 (Ticket includes lunch and wiener roast). The "Me" Train, A Time-Out Day - May 6 Take the "Me" Train and enjoy a day for yourself with meditation, gentle yoga, and a lovely meal. Create an inspirational sigh with Vintage Creations. Spend the day taking care of "you". you will enjoy dinner with all the fixin's, then head back to Alliance with full bellies and possibly empty pockets. (Ticket includes meal). See below for ordering tickets. Book early as these will sell out fast!